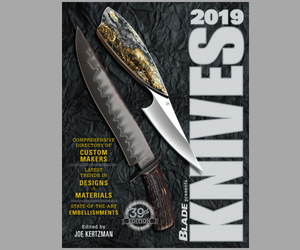 In the April 2015 issue of BLADE® is a fascinating feature article about four knife collectors whose collections each consist overwhelmingly of the knives of one knifemaker only. The collectors and the makers they collect? The article, written by Stephen Garger, lists Chris Schluter, who enjoys accumulating the knives of Bob Terzuola; Tony Wang, who began collecting Bob Lum knives in the late 1980s; Tashi Bharucha, whose collection focuses on Tom Mayo knives; and Don Deckert who collects Ernest Emerson knives. Don Deckert’s collection of Ernest Emerson customs includes these seven (left) very early “garage make” pre-tac knives. You’ve heard of people collecting dozens, even hundreds of assorted genres of knives, but have you heard of collectors amassing up to 100 or more knives of a single maker? Chris Schluter knows of such collectors and suggested the phenomenon as a topic for a BLADE story. Chris enjoys accumulating the knives of Bob Terzuola and is one of several who practice the one-maker approach to knife collecting. See the April 2015 issue of BLADE to read the rest of the article, or click here.